Soldak seems an unlikely entry into the indie RPG business because it wasn’t so along ago that founder Steven Peeler was the technical lead for Ritual Entertainment working on AAA action games. Depths of Peril has been described as an action/RPG with a strategy wrapper – a description I didn’t quite get my head around until spending a few days with an Alpha preview copy recently. Depths of Peril places the player as a factional leader in the Barbarian city of Jorvik. Soldak has presented quite a bit of gameworld lore and history on their website over the past months but in essence, the goal is for your faction (called a covenant) to rise to supremacy so you can become the leader of Jorvik – and the other factions are in open competition to do the same. Ultimately, you’ll need to launch assaults to defeat the other covenants, but in the meantime, the main gameplay is built around adventuring to improve your power while balancing relationships with the other factions until the moment is right. The game starts with character creation, which is pretty straightforward: choose a warrior, rogue, mage or priest and name both the character and the covenant you represent. There is no other character customisation at this point but the choice of class determines the five starting primary stats and the skills that you can develop over the game. Depths of Peril uses an open and mostly flat skill system with around 30 skills for each class divided into different categories. Most of them – including the exotic ones – are available right from the start…if you have the skill points to buy them. So, rather than a typical tree system where certain development options become open in a set order, you can choose to “save up” points and buy advanced skills as soon as possible. The actual gameplay starts in the city of Jorvik, which is essentially a small walled village with a house for each covenant and a centre with a few key NPCs and traders. Each covenant house holds a lifestone (which is central to the game – destroying a lifestone eliminates the covenant from the game), places to stash loot (including some special items) and a portal. Four guards can be purchased and up to four covenant members can be recruited. From there, randomly generated areas with different themes open up to the north and you can simply head off adventuring or talk to the NPCs in town for quests, which offers more rewards. Undertaking quests and adventuring is a major part of the gameplay and this aspect is essentially a standard hack’n’slash action/RPG. In some ways I was reminded of FATE – a starting town, a randomly generated world, random quests and robust hack’n’slash action – but then imagine a sort of multiplayer twist, where the point of adventuring is competing against others to build resources before taking them out. This is the key innovation with Depths of Peril - the competition and interaction with the other covenants. Each of the NPC heroes from the other factions goes out and actively adventures in the gameworld to improve their position. You’ll come across them out in the field (especially in the beginning when everyone hits the starter areas around the same time), see them in town talking to the traders and be able to influence relationships with them by trading, paying or demanding tributes and creating alliances or declaring war. The world is also dynamic, with various events cropping up. This all makes the gameplay quite fast-paced and even hectic at times. For example, recruitment is critical – you’ll want to have a full complement of the best heroes you can get to defeat the other covenants. Recruits can sometimes be found while adventuring but usually they’ll turn up in town and announce themselves available to the best offer – this means completing a quest to prove your worthiness (say, killing a certain monster) within a time limit. The other factions may also chase this recruit, so you’ll need to finish off the monsters surrounding you, get back to town (fortunately, portals are standard equipment from the beginning), perhaps heal up at your lifestone, talk to the potential recruit and head off to complete their quest before the other covenants beat you to it. Other events may even happen at the same time – a reported thief in town may relieve your covenant of loot if not dealt with in a reasonable time or raiding monsters may kill one of the key town NPCs, restricting a source of quests. One recruit can join you at a time questing and gaining levels, while the others wait back at the covenant house; you can also kick out a recruit to grab someone better (if you beat out the covenants to sign them up, of course). Like most action/RPGs, loot drops are a big part of the game and Depths of Peril has colour-coded magic items (green through to purple and sets) as well as tomes and artefacts that can be placed in the covenant house to give boosts to every member. Items can be kept, sold, given to recruits – or traded with the other covenants. In addition to loot drops, the city of Jorvik pays each covenant taxes based on their influence. Successfully completing quests increases influence with the city and it can also be traded as a tribute among covenants. Trading is the major way of building favourable relationships with the other covenants – and once one of them likes you enough they may agree to a treaty, such as non-aggression pacts, mutual protection pacts or alliances; conversely, war may be declared between covenants. The AI covenants all have agendas, so you may find some are interested in forming an alliance while others will plot to destroy you, perhaps teaming up with others to take you out. A relationships screen shows the demeanour and agreements between each of the groups. At some point a raid will be initiated. Raids are special attacks where one covenant attempts to destroy another’s lifestone, thus eliminating them from the game. Everyone in the covenant takes part, so these are usually large, frantic battles. Raids are risky and unpredictable – other covenants may join either side if they see an advantage (or have an alliance) – and even after a victorious raid has finished others may see an opportunity to attack a weakened covenant. In my first game I prematurely raided the weakest covenant, only to have every other house seize the opportunity to take me out while I was distracted. In my second, I tried to stay on good terms and out of the way while the others took each other out – but The Shining Blades just wouldn’t leave me alone. Defeating them left me vulnerable to The Gilded Coin, who saw a good opportunity to grab the ascendancy. Since the quests are random (and thus fairly generic, such as killing a named monster or harvesting 10x foozles), the success of Depths of Peril rests on the combat, character development, the competition with the other covenants and the strategy aspect. 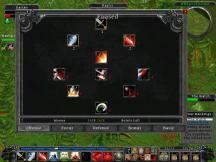 Combat is similar to many action/RPGs, with a single click to attack. 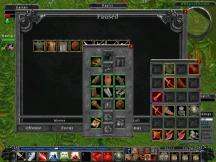 The basic attack continues without further clicking until the target is dead, in which case the AI automatically selects another target – additional skills or spells can be accessed via a hotbar. The classes I tried each had some sort of power that is accumulated with successful hits and slowly fades away out of combat – each hit with a warrior builds rage, for example. Some skills require a certain amount of this power to be built up before they become available and most skills are on a cooldown timer, all of which adds some depth to the combat. Just how much is very dependant on the build – it’s possible to create a character with mostly passive skills, while others require player speed and attention – the riposte skill is only available for a second or two after successfully parrying, for example. Death in Depths of Peril is treated as something that is inevitable – players simply respawn back at the covenant house. This takes some life from the lifestone, so dying repeatedly can put the covenant at jeopardy. In addition, there is a penalty debt on experience, although recovering the corpse significantly reduces this. All in all, I found the combat and potential range of different builds quite satisfying. Some of the skills lack graphical oomph or need more on-screen cues, but Soldak tells me this is something they may work on before release. The diplomacy and interaction with the other covenants shows promise but needs more work. At this point, much of the behaviour from the other covenants appears to be random – relatively weak covenants might obnoxiously demand tributes, for example, which doesn’t quite feel right; it also seems too easy to acquiesce to these demands by simply giving away excess loot. I’d also really like to see more interaction with the other heroes in the field, which is currently largely constrained to watching them go about their business. Hopefully the remaining development time will see these aspects refined and strengthened. Graphically, it looks bright and colourful but somewhat dated – low system specifications have taken precedence over flash, which is quite reasonable for an indie game. The version I played was 0.154, which implies considerable development time remains but I found the game remarkably stable and feature-complete and it ran very well on my modest laptop. In fact, if it were released right now, it would be more bug-free than many major releases. Depths of Peril takes a solid hack’n’slash action/RPG formula with an interesting character development system and adds a fast-paced, competitive twist. It’s not going to suit players primarily looking for story and characters but it does offer a different motivation for all that monster slaying that is highly replayable. The diplomacy aspects need some fine-tuning but with polish, this could well be one of those addictive games you keep coming back to just to kill a few hours in between “serious” titles. We'd like to thank Soldak for their assistance and we'll keep you informed on Depths of Peril's progress, so stay tuned to our news.